Under a new leadership hierarchy, the space pirates have remade themselves as a legitimate, law-abiding organization, and have rebuilt their base on a new Planet Zebes. But, there was a problem... the company they used to build the base was headquartered in North Korea, which violated Galactic Federation regulations. 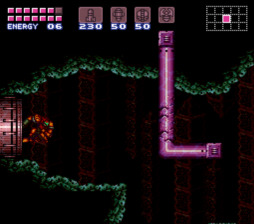 It's up to Samus to destroy the base and, if possible, identify the new leader of the space pirates and collect all 103 upgrades within the compound. This is my first attempt at hacking, and it's been frustrating, but ultimately rewarding. This is a very unpolished hack, but after a lot of help, it functions as intended, with very little that I wasn't able to make to my liking. My main purpose when I decided to create a hack was to make it easy to beat, hard to beat quickly, and most importantly, fun. I'm happy with the results, and I hope it's an enjoyable experience for anyone who plays it. 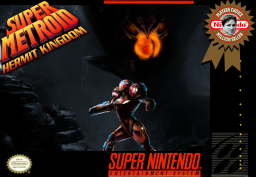 Lastly, I wouldn't have been able to make this without enormous amounts of help from Leodox, as well as lots of help from the devoted and awesome community here at Metroid Construction, some great videos by Shadow and MetroidMST, Grime's Mod Manual, tips from Person, and testing and better box art by GoopQ. Thank you all so much. You've helped me more than most of you will know. Creating a hack was just a pipe dream at one point, so it's a little surreal and really satisfying to have actually made one. 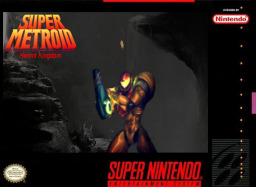 With that, I hope you enjoy Super Metroid: Hermit Kingdom. 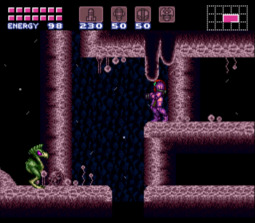 This is a halfhack that throws some unexpected twists at the player, and probably the most creative use of Crocomire in any hack. Also some nice little bits here and there. In the end though, it's not much more than a fairly well done halfhack. The one really interesting thing happens in the early portion of the game, and the back half is quite probably going to be bogged down by searching for one item. 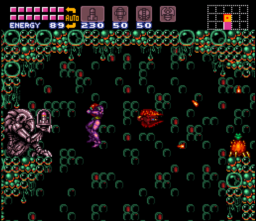 It's a fairly solid hack and decent entry into the Super Metroid hack world though, and for a first hack it definitely shows some nice promise. I love this game because you have to learn how to do some blue suit tricks in order to get 102% you don't have know the hard stuff to complete the game, but it was really fun to learn more and get all the items! For a halfhack this is quite well done, for a first hack this is quite well done, throw those two factors together and you get a very well done creation, although, that doesn't keep it safe from critiquing. 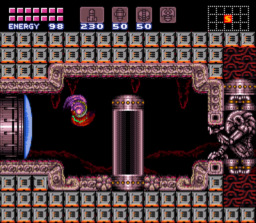 This hack does a great job of throwing some random but fun things at the player, the most noticeable being the bosses and mini-bosses, crocomire for example throws a massive curve ball at the player, The save stations are also very unexpected. 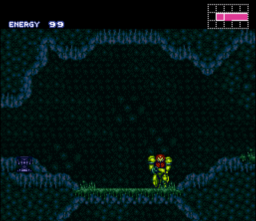 The design choice is nice in a lot of late/mid game rooms, but the beginning just seems like either nothing was changed or a cluttered mess. Next up, I think the amount of trolling performed on the player is executed close to masterfully, The amount of speedboost blocks might get a little excessive, but it's a great build up for when you finally get speedbooster, you feel like you can go anywhere. Not to mention that if you mess certain tricks up, there is some backtracking, but they're done at just the right lengths that won't make a player go insane if they choose to try. Lastly, the skills needed to beat this do exactly what the description says, you don't need any fancy tricks to beat it, but if you want to be a completionist, the tricks make it just that much harder to go fast. But that also comes with a price, even regular players might find it hard to go fast, there's a little too much searching for items just to have them be useless minors, not too much to make the hack un-enjoyable, but still. All in all for the factors this hack was created with, it's a decent halfhack that does a wonderful job showing the progression of a hacker, with a few glitches and flaws here and there, I'd highly recommend it. Good hack. I thoroughly enjoyed it, it's one of the few hacks I couldn't put down. 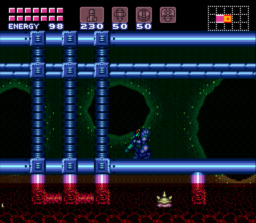 Some items were hidden very well, however, even some that you need to finish the game. I spent a good hour looking around for a single item that I needed to move forward. The boss order was creative, as was some of the key item order.